Jon Harper an expert grower from the U.K. is the creator behind this chile. To understand you must see the history. Jon first made the 7 Pot Bubblegum which is known for the color of the pepper bleeding up the calyx and up the stem. This is a Moruga/Yellow 7 Pot cross. 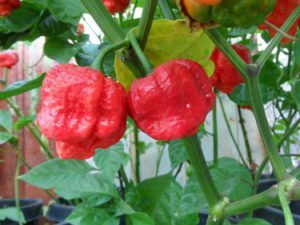 Later he crossed the 7 Pot Bubblegum into the Naglah (Bhut Jolokia X 7 Pot Douglah). This then became know as the Borg 9. Why he named it Borg 9 I don’t know. Some say it was nick named after actor Ernest Borgnine. Some say it is named after the infamous Borg aliens from Star Trek series. If I ever talk to Jon I will correct this. Now there is some sweetness to the Borg 9. 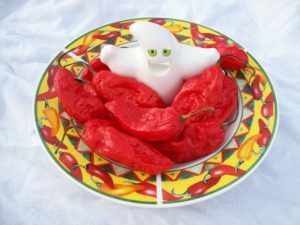 Some say it’s like an extreme Ghost flavor which is kind of earthy or smoky. The Borg 9 Red chile plants grow up to 4 feet tall. No official testing has been done but some believe it may be one of the worlds hottest chiles. This is the Chocolate or Brown colored variant of the Borg 9 chile. Jon Harper an expert grower from the U.K. is the creator behind this chile. To understand you must see the history. Jon first made the 7 Pot Bubblegum which is known for the color of the pepper bleeding up the calyx and up the stem. This is a Moruga/Yellow 7 Pot cross. 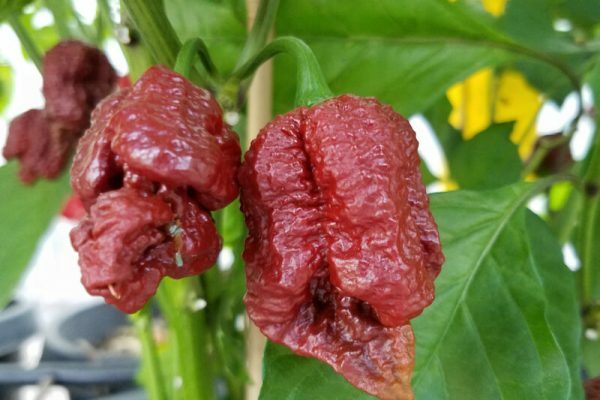 Later he crossed the 7 Pot Bubblegum into the Naglah (Bhut Jolokia X 7 Pot Douglah). This then became know as the Borg 9. Why he named it Borg 9 I don’t know. Some say it was nick named after actor Ernest Borgnine. Some say it is named after the infamous Borg aliens from Star Trek series. If I ever talk to Jon I will correct this. Now there is some sweetness to the Borg 9. But it has a nasty burn. 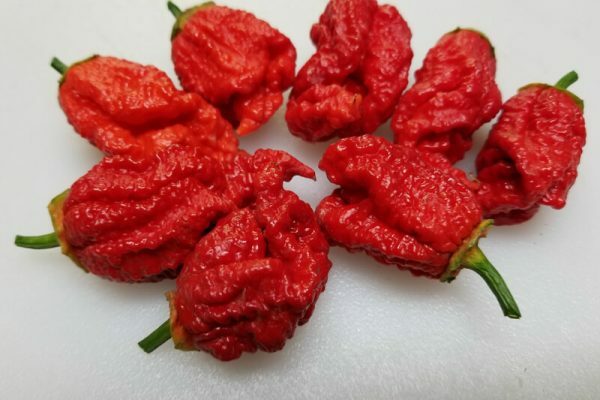 Some say it’s like an extreme Ghost flavor which is kind of earthy or smoky. The Borg 9 Red chile plants grow up to 4 feet tall. 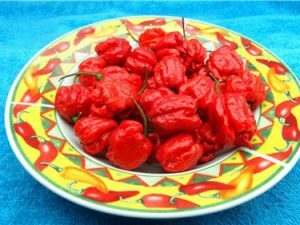 No official testing has been done but some believe it may be one of the worlds hottest chiles. Some say the Chocolate is hotter than the red. Grow both and decide for yourself. Jon Harper an expert grower from the U.K. is the creator behind this chile. To understand you must see the history. 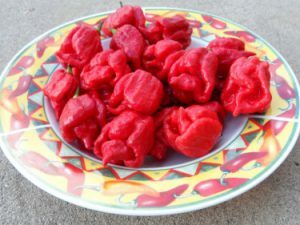 Jon first made the 7 Pot Bubblegum which is known for the color of the pepper bleeding up the calyx and up the stem. This is a Moruga/Yellow 7 Pot cross. 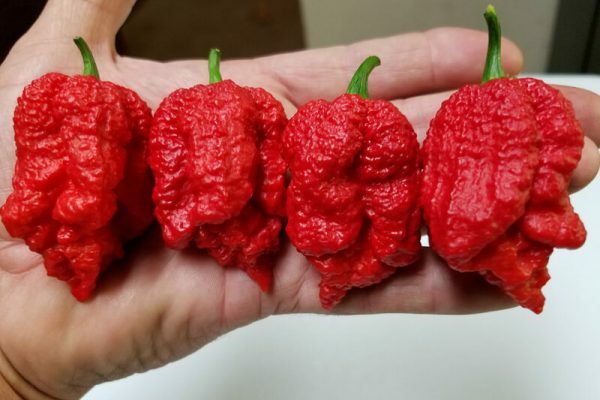 Later he crossed the 7 Pot Bubblegum into the Naglah (Bhut Jolokia X 7 Pot Douglah). This then became know as the Borg 9. Now the Borg 9 did not bleed up the stem like the Bubblegum. However a few years later some people growing the Borg 9 got plants that produced peppers that were now Bleeding up the stem! So that folks is now called the Bleeding Borg 9. Crossing crosses at a young stage will always bring surprises. Now this chile has some fruitiness but also has extreme heat. Expect some variation as it is still young and not many have grown it as of 2015. The Bleeding Borg 9 chile plants grow up to 4 feet tall.